Our current mining algorithm, Equihash, is used by many different coins without any personalization. It was originally developed by Zcash and based on the parameter set <200,9>. We are going to upgrade to Equihash with a the parameter set <144,5>, with some customization. We’ll call it “Equihash-BTG,” for now. This will keep our blockchain ASIC-resistant and add an immediate measure of safety from 51% attacks. Equihash, which was first developed and used by Zcash, was designed from the outset to be an “ASIC-resistant” Proof of Work algorithm. The developers set out to accomplish this by making it a memory-hard algorithm. (See the Biryukov and Khovratovich paper on Equihash.) What does this mean, how does it make mining ASIC-resistant? A memory-hard algorithm is one which requires a lot of memory to be able to run. It simply won’t work on hardware that doesn’t have enough memory. When making an ASIC – an Application-Specific Integrated Circuit – adding memory is very expensive, and the more memory you need, the more expensive it gets. With a high enough memory requirement, building a “single-chip solver” on an ASIC becomes so expensive that you could not hope to earn enough in mining to pay for the ASIC. It’s impossible to profit. Exactly how much memory is required? That depends on a couple of parameters. Equihash is the name for the general algorithm, but the exact implementation depends on two parameters, < n, k >. Today’s common Equihash coins run on Equihash <200,9>, so n = 200 and k = 9. This setup is currently used interchangeably by Bitcoin Gold, Zcash, Zencash, and many other Equihash-based cryptos. This <200,9> version of Equihash requires a minimum of 50 MB of memory but can run much faster with 144 MB of memory. This was not the most demanding (most memory-hard) version of Equihash considered at the time, but it appeared to be “good enough.” These memory requirements were previously sufficient to prevent building an ASIC, based on the comparison of ASIC cost to coin value a year or two ago. Since then, Zcash – which was worth $30 in Feb of 2017 – has grown to be worth over $250, and now there are multiple coins that can be mined with the same Equihash. Meanwhile, the cost of transistors in an ASIC has gone down. With these changes, it became possible to build an ASIC that can work with just enough memory to profitably mine the current Equihash coins – and this is precisely what has come to pass. But this doesn’t mean that Equihash is defeated – just that Equihash <200,9>. We’ll be adopting different parameters, <144,5>, for Equihash-BTG. Although these numbers are smaller than <200,9>, it means the algorithm actually requires dramatically more memory to run – so much more that we believe ASICs will be impossibly unprofitable for quite some time. The <144,5> parameters require a minimum of 700 MB to run and use about 2.5 GB to run efficiently (that’s 17 times larger!) This should be too expensive to produce with an ASIC right now, while most graphics cards used by our miners already have that much memory or more. The sheer amount of memory required for Equihash-BTG pretty much forces the use of DRAM, which calls for a dramatically different design than a single-chip solver for regular Equihash. Even if a specialty miner is developed for Equihash-BTG in the future, it will not have as dramatic an advantage over a GPU as the specialty Equihash <200,9> miners. This significantly decreases the threat ASICs can pose to our network. While we know that this parameter change is not a permanent fix – this one change won’t stop ASICs forever – we know it will solve the ASIC-resistance problem for now, and gives us time to consider other alternatives for the longer term, if necessary. 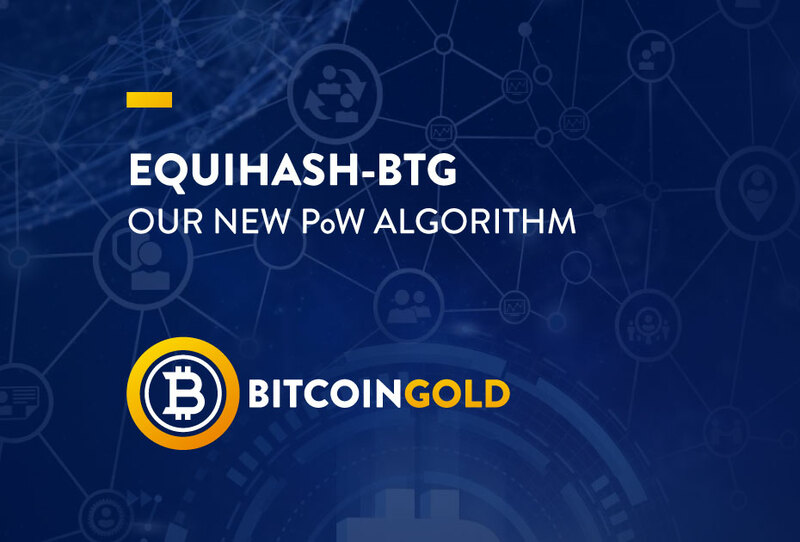 The new parameters in Equihash-BTG also provide a few other advantages over <200,9>, which you can read about in our more detailed Forum post about Equihash-BTG. The new algorithm doesn’t just protect us from ASIC miners – it moves us into a different “pool” of hashpower, which also gives us a measure of safety against the kind of 51% attacks against Exchanges that happened over three or four days this past May. While we’re very close to being able to provide Release Candidate versions of all the software to the public, we still aren’t ready to commit to a specific fork date. We’ll begin releasing detailed information about progress with the code and timing to all of our partners in the coming days to assist them in preparations. Because this kind of Network Upgrade will be enacted via Hard Fork, we need to be sure our partners are prepared. (A Hard Fork does not mean there will be a new coin – it just means that the prior software won’t be compatible, so the Upgrade is not optional.) Our ecosystem includes dozens of partners, including mining pools, miners, the makers of mining software, blockchain explorers, wallet hardware and software providers, third-party merchant services, and over fifty exchanges! We’re doing our utmost to ensure that everyone in our community has the opportunity to prepare so that nobody is left behind when the time of the Upgrade comes.